Wow, many Brown University graduates feel life is going well for them. Many Harvard College graduates feel the opposite. With teenagers in the house, college admissions has become a fairly regular household topic. I’m a big believer in due diligence. Comes with my job. I assume that all the pretty college web sites, school tours, and various collateral are this: marketing material. They may or may not accurately reflect what life really is like at a college. I was stunned by how disparate the average answers are. 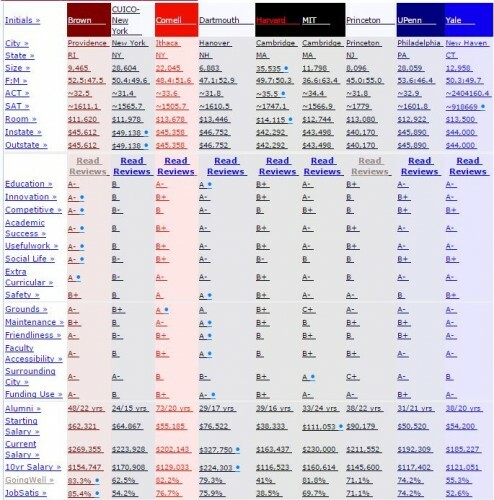 For example, the site lets you compare colleges. There is a pre-set table for some selective schools. You can hit the link or blow up the pic below. Of course, these surveys have huge limitations, but, given that these are relative rankings, any systemic flaw should affect all schools. Ultimately, IMO, college is about “fit” between the school and the student. I’m sure there are many, many happy Harvard College graduates. But, all this data are worth pondering, given private colleges cost over $200K. Crowd-sourced data are pretty cool.